MIAMI, Fla. (MarketWatch) — Is it possible to predict what the stock market will do next? Two useful contrarian indicators, the American Association of Individual Investors (AAII), and The Investors Intelligence Sentiment Survey (II), measure the mood of investors. When these two surveys get frothy (over 60% bullish or bearish), it’s a signal the markets are becoming extreme. That’s when many traders consider doing the opposite of the crowd. Although these sentiment surveys can’t precisely time the market, both have had uncannily reliable records of forecasting tops and bottoms. For example, in March 2009, these surveys were signaling extreme pessimism — which happened to coincide with the lows on the Standard & Poor’s 500-stock index and the Dow Jones Industrial Average. As you may recall, people back then were running for the exits, frantically selling stocks for the safety of cash or bonds. 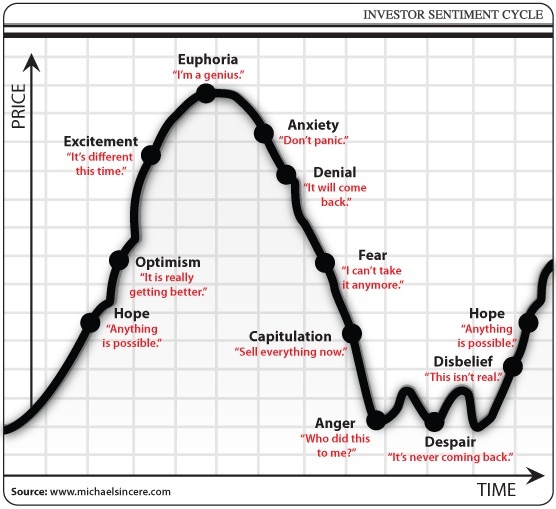 The reason sentiment surveys work is that humans almost always overreact when the market hits extremes. Therefore, if you only rely on your emotions to trade or invest, more than likely, you’ll get it wrong. Suggestion: look for long-term trends in the sentiment surveys, not just one week’s results. In addition to using sentiment surveys, most traders use one or more indicators plotted on a chart to help determine market direction. They primarily use them to increase the probabilities that a specific trade will be successful. It also helps with entries and exits. Even investors and professional money managers routinely refer to indicators for an unbiased second opinion. Moving Averages: Helps to determine if a trend has ended or begun. New High/New Low: Tracks stocks that are making new highs or new lows. 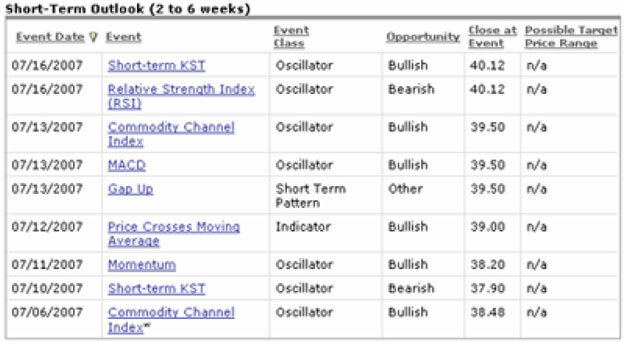 RSI or Stochastics: Helps traders determine if a stock or market is overbought or oversold. Arms Index (TRIN): Helps traders identify overbought or oversold conditions. Advance-Decline Line: Helps traders measure how many stocks are participating in a rising or falling market. CBOE Put/Call ratio and ISEE Call/Put ratio: Contrarian indicators that track the buying and selling of options. VIX: Measures fear in the stock market by tracking implied volatility of call and put options. Can these indicators predict what the market will do next? The answer depends on the time period: the shorter the period, the easier it is to have correct predictions. While no indicator can tell you with 100 % certainty what will happen in the future, they can give important clues. Even though indicators are useful for anticipating short-term direction, no one can consistently predict the market’s highs and lows and attach a date to it. The market’s Holy Grail is still elusive, but many are still looking. Even if you’re armed with a handful of reliable indicators, it’s nearly impossible to predict the unexpected, for example, when the price of oil or interest rates will rise, or when the next war may erupt. For traders with short-term mindsets, indicators are invaluable. Long-term investors, however, may find many technical indicators less than helpful. A few years ago, I spoke to Peter Lynch, bestselling author and legendary mutual fund manager. I asked him if it’s possible to predict the market and he replied: “I’ve been trying to get next year’s Wall Street Journal for 40 years. I’d pay an extra dollar for it. “I’d love to know what will happen in the future,” he said. “I have no idea what the market will do over the next one or two years. What I do know is that if interest rates go up, inflation will go up and the stock market will go down. I also know that historically about once every two years the market has a decline of between 10% and 20%. These are called corrections. Perhaps one out of three of these corrections will turn into a decline of 20% or greater. These are called bear markets. Finally, if you study booms and busts throughout history, you’ll recognize that although many stocks come and go, human behavior never seems to change. At market bottoms, people ignore or fear the stock market. At the very top, they can’t get enough of it. While you’re waiting for the eventual top or bottom, you might consider the advice of renowned trader Jesse Livermore. Livermore said that after years of making and losing money, he discovered one of the secrets to being a successful trader: Be bullish in a bull market and bearish in a bear market. This is excellent advice except for one problem — are we in a bull or bear market? Perhaps some readers will have an answer. Many of the anecdotal lessons included in the book are well known to experienced traders. For example: the market is always right; don’t over-trade; never argue with the tape; use stop losses, and always trade with the primary trend of the market. Almost anyone can learn the mechanics of trading. It’s the psychological pitfalls that make trading one of the most challenging activities. No matter your skill level, it’s important to remember and obey the rules of engagement — another word for discipline. After going broke three times in less than two years, Livermore has this advice: “Being broke is a very efficient educational agency.” He says that you learn little from your winners because they often take care of themselves. It’s the losers that will teach you lessons to last a lifetime. And as long as you don’t make the same mistake twice, you always have the opportunity to trade another day. Much of Livermore’s success came from observing people, individual stocks, and the overall market. Here’s how he put it: “I have found that experience is apt to be a steady payer in this game and that observation gives you the best tips of all.” And, according to Livermore, “Not even a world war can keep the stock market from being a bull market when conditions are bullish, or a bear market when conditions are bearish. And all a [trader] needs to know to make money is to appraise conditions.” The importance of studying general market conditions was one of his greatest discoveries, he claimed. Livermore explained some of the methods he used to buy and sell stocks. One of his methods was to buy as soon as a stock made a new high, which he said will almost certainly bring him profits. Later, he elaborates: “I have often said that to buy on a rising market is the most comfortable way of buying stocks. Now, the point is not so much to buy as cheap as possible or go short at top prices, but to buy or sell at the right time.” He adds that he scales into or out of a stock as it rises or falls. He warns, however, that although this method sounds easy, you always have to guard against your natural impulses: fear; hope; greed, and, most important, a swelled head. Many of the lessons included in the book are as useful today as when it was first published in 1923. Livermore, a true legend in his own time, didn’t need to prove to anyone that he was right about the market. He said that the proof could be found in his broker’s statement at the end of the month. Can these indicators predict the market’s future, or is it just wishful thinking? Although everyone wants to believe in miracles, especially during the holidays, hope alone won’t make the market go up. And yet, some of these indicators have been extraordinarily reliable in the past. According to market lore, the stock market is destined to surge from Christmas until the beginning of the New Year. As a result, many investors rely on the magic of the so-called Santa Claus Rally to stuff their portfolios. The theory is that optimistic money managers restock their portfolios with financial goodies fueled by bullish investors and year-end bonuses, causing the market to rise. Believers in this theory also surmise that the majority of market pessimists have taken the week off. Although naysayers are often skeptical of the Santa Claus Rally, MarketWatch columnist Mark Hulbert says there is strong historical support for this seasonal pattern, which “has the best risk-adjusted performance of any timing system I have tracked over the last two decades,” he writes. In the early 1980s, University of Chicago graduate student Donald Keim, now a professor of finance at the Wharton School of the University of Pennsylvania, observed that small stocks outperform large stocks in January more than in other months. The idea was that individuals and large institutions sold stocks at the end of the year and bought back in January. This pattern continued for nearly every year from the late 1920s through the late 1980s. Eventually, this idea turned into the so-called January Effect, coined by Keim. The theory: if small-cap stocks outperform large-cap stocks in January, it could be a good year for the stock market. If small-cap stocks underperform large-cap stocks in January, it could be a bad year. Although many financial reporters still write about this pattern, it has lost much of its power over the last decade. Fortunately, there is another seasonal phenomenon that is more reliable than the January Effect. Often confused with the January Effect is the January Barometer, devised by Yale Hirsch in 1972. The theory: Whatever happens to the Standard & Poor’s 500-stock index (CME:INDEX:SPX) in January will set the mood for the rest of the year. “As January goes, so goes the year,” says Hirsch. 1.If the S&P is up in January, the market is likely to have an up year. 2.If the S&P is down in January, the market is likely to have a flat or down year. Nevertheless, he points out that the S&P’s 16 % correction from April to July confirms the pattern; i.e. every down January is followed by a new or continuing bear market, a 10 % correction, or a flat year. Although no one is suggesting that you make big bets based solely on the results of these holiday indicators, they can provide important clues. In addition to doing insightful analysis and research, astute traders and investors also measure the mood of the market using technical, sentiment, and economic indicators. No matter what side of the market you’re on, many pros believe that January is still the most important month of the year, especially during that first week. Therefore, with the holidays quickly approaching, it might be useful to mark January on your calendar now. BOCA RATON, Fla. (MarketWatch) — Of the hundreds of market indicators used by traders and investors to help predict the market’s direction, one style never seems to fall out of fashion — but it should. The Hemline Index, first observed by economist George Taylor in 1926, predicts the market’s future by the way women dress. It works like this: when women’s hemlines (the line formed by the outside of a skirt) are shorter, women are taking more risks and spending, which is good for the economy and the stock market. Longer hemlines, in contrast, are a negative sign for the economy. I’ve been amazed at the number of financial reporters, fashion editors, and professional fund managers who are enamored with the Hemline Index. For almost 85 years, thousands of articles have been written about this indicator..
After doing extensive research for my book, All About Market Indicators, I needed to find out if the popular but obscure Hemline Index really works. Is it a valid indicator or a silly myth? I began my research by attending two fashion events in Miami Beach: Mercedes-Benz Fashion Week and Funkshion Fashion Week. These shows are the real deal, and include the latest fashions by emerging and well-known designers. Sports celebrities, movie stars, and the news media also attend the shows along with dozens of models. I wondered: is this why so many financial reporters write about the Hemline Index? I got it. In Miami Beach, at least, the Hemline Index is completely immaterial. “You mean the indicator is dead?” I asked. “I hope so,” Solomon quickly replied. She explained that the length of a woman’s hemline has little to do with the economy or the stock market. Back in the 1920s, hemline length was based on how much fabric was available, and not on the shopper’s mood or desire to take risks. I asked her if the bright and bold new designs at the fashion shows meant that the economy was improving. Perhaps this was a leading indicator. “Is there anything in fashion that will help you make economic forecasts?” I asked. “Absolutely,” she said, “but you have to follow price. During a recession, if you don’t have a lot of money, you’ll buy the lowest price in the color of the moment. And when the economy is flush, you’ll buy the same color but spend more money.” She says that fashion insiders also know it’s a recession because women stop buying designer clothes. By the time I got home that night, I realized that financial reporters, including myself, have to stop writing about the fun but insignificant Hemline Index. You took us on a marvelous ride, George Taylor, but your ritzy indicator is not in vogue anymore. Maybe his creation was a good-natured gag. If so, he confounded a lot of people. Fortunately, I thought of a replacement, which I’m calling The Fashion Indicator. How does it work? Rather than study trends such as hemlines or color schemes, you watch shoppers, analyze clothing prices, and talk to designers for insights into how much money is being spent. It takes more investigative work but it’s much more useful. When designer labels become popular and people spend more money on clothes, it could be a very good year for the economy. BOCA RATON, Fla. (MarketWatch) — One reason why options have a reputation for being so difficult is a mysterious concept called “implied volatility.” This is the unknown factor built into the price of an option. But before you can understand implied volatility, it helps to know how options are priced. First, the option premium, or price, is made up of several factors, including the price of the underlying stock, the strike price, how much time is left to expiration, interest rates, dividends, option type (put or call) and the “X-factor”: the volatility of the underlying stock; or more specifically, the estimated future volatility of the underlying stock. If you exercised the option today, and then eliminated the resulting stock position from your account, that is how much cash you would collect. Out-of-the-money options have zero intrinsic value. The intrinsic value is immune to time decay. Calculating intrinsic value is easy. Here is the formula for call options: Stock Price – Strike Price = Intrinsic Value. For example: $91 – $90 = $1 (Stock is $91 and the strike price is $90). So when you hear option traders say that an option has intrinsic value, it simply means their option is in-the-money. Now, let’s say you’re ready to buy a call option and calculate the intrinsic value of the XYZ option at $1 (for example, $91 stock price- $90 strike price = $1 intrinsic value). There is a month left to expiration and the question is: How much time value should be included in the option premium? Here’s the intriguing part: when you look at the price of similar options (same stock price, same strike price and expiration date, but a different underlying stock), you discover a wide range of prices. The options appear similar, yet the option prices tell us that something is affecting the premium. That something is the X-factor — volatility. For instance, the call option for stock A may be trading near $1 when a similar-looking option for stock B may be trading near $4 (or more). Why is the $4 call so expensive? It’s all due to that X-factor. When a stock has been volatile, or is expected to be volatile due to a pending news announcement, its option prices are higher. That’s because option buyers earn a profit when the stock makes a big move. When such a move is anticipated, buyers pay higher prices (and sellers demand higher prices). When a small stock-price change is anticipated, options are priced much lower. The option price is swayed by the estimated volatility that is plugged into the option-pricing model used by market makers, who establish bid and ask prices for all options. They use calculators to determine option prices. Calculating option values requires the use of a complex formula. Fortunately, you can find an options calculator on theChicago Board Options Exchange (CBOE) or Option Industry Council (OIC) Web sites. The calculator is based on the famous Black-Scholes model and is easy to use. Volatility is considered the most important factor when pricing options. Other factors are known, but volatility must be estimated. Yet not everyone uses the same estimate, and that causes options to appear inexpensive to some traders and costly to others. At a basic level, volatility measures the movement of a stock over a specified time. It is that elusive factor which can cause you to overpay for options and lose money even when correctly predicting both the direction of the underlying stock and the timing. This common situation is extremely frustrating for the novice trader who does not understand the concept of implied volatility. Too often, the novice pays too much for his or her options and loses money. Rule No. 1: Do not overpay. Use an options calculator to determine implied volatility. To make the calculation, enter other parameters such as the stock price, strike price, interest rate, dividends, and expiration date, and option type (put or call). The calculator does the rest. Next, decide if you are willing to pay that implied volatility to purchase options (or accept that implied volatility when selling). In simple terms, implied volatility represents a feeling of urgency that traders have about certain options. More exciting stocks have high implied volatility, and you must pay more. Less-exciting stocks have a lower implied volatility, so they’re cheaper. During volatile markets, implied volatility, and thus option prices, often skyrocket. There are a number of option strategies that involve volatility. First, you can buy or sell options based on your assessment of current implied volatility. Second, you can “buy or sell volatility.” In other words, base the trade on profiting from a change in implied volatility, rather than on a change in the stock price. This is a concept used by sophisticated traders. A basic understanding of implied volatility can help you decide how much to pay for options, and that’s a good tool to have during volatile markets. Michael Sincere is the author of Understanding Options (McGraw-Hill, 2006) and All About Market Indicators(McGraw-Hill, 2011). Mark Wolfinger writes a daily blog, http://blog.mdwoptions.com. The challenge, she cautions, is interpreting the data. Volume reflects demand, but doesn’t always tell you if it’s coming from buyers or sellers, or from large players or small. There are dozens of systems to interpret volume data into trading signals, here is how volume plays into a couple of popular systems: the CAN SLIM® investing system and The Wyckoff method. Volume, combined with price, is “critical to spotting emerging trends,” says Chris Gessel, executive editor and chief strategy officer of Investor’s Business Daily. He describes how price and volume are woven into the CAN SLIM investing system, a top-performing strategy recognized by the American Association of Individual Investors (AAII). The CAN SLIM system was developed by William J. O’Neil, chairman and founder of IBD and author of the best-selling book, How to Make Money in Stocks. Because it can take institutional investors weeks or months to complete their purchases, Gessel says that “individual investors have a chance to piggy-back those purchases and ride those price run-ups.” If you watch price and volume carefully, he suggests, you can also detect clues it is time to get out. One Wyckoff technique involves looking for a buying or selling climax. A trader looks for a larger than normal price range and heavy volume to spot a trend change. When using this system, the trader establishes a stock position after the price moves past support or resistance if it looks like the trend is reversing. “If there is little or no downward follow through when the price passes support, you can go long at the danger point where the risk is the least,” Weis says. He adds that failed breakouts above resistance can be used for shorting. Weis admits he uses no mathematical indicators. Instead, his tools include the length of the daily range, the position of the close, and volume. “I’m looking for ending action which reflects a climatic top or bottom,” he suggests. You may be able to recognize the climatic change by an unusual amount of volume, he notes, usually associated with a wide price range for the day. Wyckoff referred to this condition as hypodermics, when a market goes straight up. 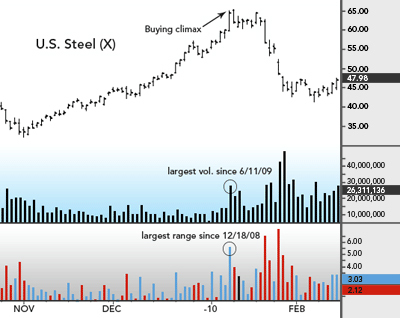 The chart of United States Steel (NYSE: X displayed below) is a classic example. For Weis, the large range and heavy volume after a prolonged advance indicate the large operators are unloading their long positions under cover of public buying. “When the whole world is buying, it’s the easiest time to unload long positions undetected,” he says. It also helps to learn the meaning of some of the less dramatic-looking price bars. “If the daily range is narrow, and goes under the low of several days on heavy volume,” Weis explains, “and rebounds to close unchanged, we know some large buyers are holding the bag open to trap the sellers.” Put another way, the volume shows increased effort but the narrow range reflects little reward. Not studying volume is akin to “putting my hands behind my back and blindfolding me,” quips Turner. “Volume tells you the psychology of the market. It’s also one of the only indicators that is not derived from price, so it gives you a second opinion.” She says the goal for her is watching volume “from the bushes and pounce before everyone else.” No matter which method you use to study volume, there is little doubt that volume combined with price cannot be ignored by informed investors and traders. Elder pays attention when a stock reaches its old high or old low. He is a buyer when a stock breaks down slightly below its old low and his indicators show a bullish reversal. “When everyone is afraid the stock is going to go down, I am interested in buying,” he says. Kornstein agrees. “It’s often difficult to define if it’s truly a reversal that has turned into an established trend,” he says. Alan Farley, author of The Master Swing Trader (McGraw-Hill, 2000) and founder of www.hardrightedge.com, likes to buy in mild times and sell in wild times. “I will watch the price action for three or four days,” he says. “My ideal entry point is when it’s quiet, the volume has dropped, and the market is not moving.” On the other hand, when the stock shoots up higher in a rapidly rising market, he’ll sell his position. “Buy when they’re crying, and sell when they’re yelling,” he quips. Farley says he never tries to pick tops or bottoms. “Amateurs try this, and they get crushed.” If a stock looks too high or looks too low, Farley says, it is not a reason to buy or sell. He would rather wait until the market bottoms out or turns around. “A turnaround won’t occur if a stock is moving straight up,” he says. “If the stock is going to extend, even your indicators won’t tell you when it’s going to stop. I will wait until the stock has established a range, has a transitional pattern, and all those people who own the stock are afraid to lose their profits.” He likes to give the owners a chance to be disillusioned, which is where the eventual sell-off comes from. Conversely, Elder especially likes using the reversal strategy on blue-chip stocks. 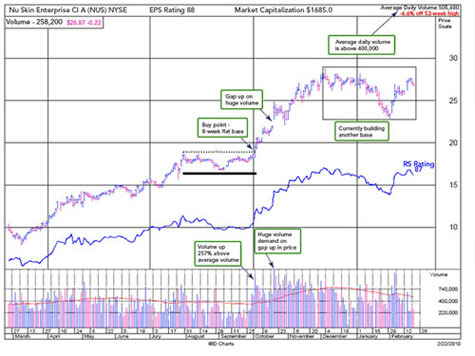 These stocks have wellestablished charts that are easier to identify for potential reversals. “You probably won’t get hit as hard with the large-cap companies,” he suggests. According to Kornstein, a recent example of buying a reversal occurred with Countrywide Financial. Because of subprime problems, other financial leaders like Citigroup (NYSE:C) and Bank of America (NYSE:BAC) sold off in unison with Countrywide, although they weren’t involved in the same kind of lending business. “Countrywide got hit because of the subprime problems, and all financial stocks plummeted. This created an opportunity to buy financial stocks at a lower price,” he says. Farley depends heavily on patterns to determine the best entry price using moving averages and stochastics to get a feel of who is in charge, bulls or bears. In general he looks at patterns, primarily those on the daily chart. “In reversals, you look at topping patterns or bottoming patterns depending on whether you are reversing from an uptrend or downtrend.” For example, a topping pattern is a double or triple top or a head-and-shoulders pattern. The basing pattern is softer, similar to a bowl-shaped pattern. “I might want to short a topping pattern or buy a basing pattern,” he adds. Even though you can short on the way up, many pros generally agree that shorting rallies is risky. “Trying to short an overbought stock is dangerous,” Kornstein says, “because the market might not consider it overbought.” For example, Whole Foods Market (NYSE:WFMI) is fundamentally overvalued with a P/E ratio near 35 (compared with a P/E of 15 for other supermarkets); nevertheless, the stock is in the portfolio of many institutions and has a large following. Therefore, Kornstein is comfortable buying this stock on a dip. Likewise, Farley won’t short a rapidly rising market. “I’m not interested in selling short a strong uptrend.” He prefers to let the stock drop to a support level and go long at a better price. “If you are reading your technical indicators correctly,” he says, “you will find the spot the stock will pull back to, where it won’t go much farther—and that’s where you want to be a buyer.” Farley observes that a stock usually doesn’t reverse without first having some kind of a basing or sideways pattern. According to Farley, the biggest mistake that people make using this strategy: “they believe a stock will go up forever, so they don’t protect their profits. If you have a profit, don’t assume that the direction will persist forever. You have to manage that position. You have to put a stop under it and be willing to take less profit. The market can unexpectedly turn around, catching you off guard.” This is one reason Farley enters tight stops on rapidly rising stocks that are in the profit zone. For those just starting out, Farley suggests trading fewer shares if you aren’t experienced using this strategy. In addition, study a basket of stocks in a specific sector until you become an expert on how these stocks trade, he says. Then use technical indicators and stock patterns to enter or exit your position. Did you know you can use options to make money every month or every quarter? And you can use options as insurance, for example, to protect your stock portfolio. And if, on occasion, you wanted to speculate, you could leverage your money to double or triple your profits. It will cost you a lot less than if you bought stocks. And finally, if you like to short stocks, it can be safer to use option strategies than to use the stock market. Speaking of safety, with most option strategies you know how much you can lose in advance. If used properly, options can be used by all investors and traders to generate income, for insurance, and to speculate. By the time you finish this book, you should have a good idea what options can do for you and whether you want to participate. Discusses how to open an account, evaluate a stock, and place a trade; strategies for making money slow or fast, with the advantages and dangers of each; and ten costly mistakes that are easy to make. Howard Kornstein is a full-time independent trader with over 25 years experience trading stocks and options. He is also a former hedge fund manager. Sincere: What would you say is the most common trading mistake? Kornstein: It’s refusing to admit that you’re wrong. Then the trade runs away from you and you are further wrong. For example, everyone thought that Sirius satellite was going to be better than FM radio. The story was right but the stock has failed. In this case, you sell out and take the loss. In the stock market it’s better to assume you have a loser until it proves otherwise. It is also easier to exit the position if you think this way. Sincere: What technical indicators do you use? Kornstein: I have learned that the simpler the indicator, the better the chance for success. The 50-day moving average (MA) is my benchmark. I like a stock that has fallen below the 50-day MA, has stopped falling through the 50-day MA, and is now on its way back toward it. How Fidelity can help — Technical Events From RecogniaTM. All screenshots and stock symbols are for illustrative purpose only. Sincere: Do you use fundamental analysis? Kornstein: Yes. I always consider P/E (price/earnings) ratios. You must expect a stock with a low P/E ratio to have a longer holding period. On the other hand, the higher the stock’s P/E ratio, the faster and more volatile the trade will be. How Fidelity can help — Stock fundamentals. All screenshots and stock symbols are for illustrative purpose only. Sincere: What are the most valuable lessons you’ve learned about the market? Kornstein: I learned to be very cautious about news stories. Don’t place a trade based on a rumor. Another lesson I learned is when shorting, try not to carry the stock for more than two or three days. If after that period of time it’s still not in the profitable range, you should probably sell it. Sincere: How long do you hold your stocks? Kornstein: I give different time frames to different companies. For example, I expect the gains on a diverse company like General Electric (NYSE: GE) to be slow-upwards of one year to show a profit. For a NASDAQ technology company, I wouldn’t hold it more than a few days. Sincere: Where do you cut your losses? Kornstein: It depends on the position. If going long on a blue-chip stock like General Electric, I would give 5%. On a NASDAQ stock, I would give 3% or less. If shorting, one half of one percent. Sincere: Do you believe that trading is similar to gambling? Kornstein: The trade becomes a gamble when you say you have a 50/50 chance of it being a winner. On the other hand, if a person says I have an 80% chance that this company might perform well in this quarter, that’s not gambling. That’s making an investment decision based on the knowledge the person might have. Sincere: What do you think most people don’t know about the stock market? Kornstein: Most people don’t realize that the value of the stock is the perceived value, not the actual value. For example, Apple (Nasdaq: AAPL) is perceived to be better than Qualcomm (NASDAQ: QCOM) so people are willing to pay a higher multiple. As a trader, I avoid companies that are popular and carry a premium. The cost of the stock is far greater than the amount of profit the company can possibly make. Linda Raschke is a professional trader for LBR Group and the co-author of a number of books including ETF Trading Strategies Revealed (Marketplace Books, 2006). Sincere: How do you plan your first trade? Raschke: I like to have an initial bias or plan before the market opens. I am looking for a certain play or setup, perhaps a breakout. I want to see where the market opens and where it is trading relative to the previous day’s high or low. I also note if there is a trend off the opening price, and if it starts making new highs or new lows outside of the first hour’s range. Sincere: What do you look for in a stock? Raschke: I look for patterns. I take it one step, one day, and one swing at a time. If you aim for too big of an objective, you won’t make it. It’s how you manage the trade or the risk once you are in the market. That’s the only thing you can control. If you make an execution error or you do the wrong size, you should correct it immediately. You have to take your hit and get out of it right away. Sincere: What about time frames? Raschke: I believe it is very important to study at least two time frames-the weekly and daily. For short-term trades, I use the hourly and 5-minute charts. Sincere: How do you manage risk? Raschke: If the market moves in my favor, I tighten the stops. I look for spots where I can take profits. I don’t think I will get 10 points when it will only give me 2 points. Everyone buys a stock and thinks it’s going to go up 10 points, but it might sit there for months. Sincere: Do you always use stops? Raschke: I can’t imagine putting on a trade and walking away from it without a stop. It’s like doing heart surgery with the lights out. If you are a home-based trader, you have a responsibility to have a stop in place. You also must know why you made that trade and what time frame you are playing for. Sincere: What do you think drives market volatility? Raschke: I think that people would be surprised that 40% of the S&P volume comes from automated “black box” algorithms playing for short term, two-second ticks. Everyone thinks the market is manipulated by this big master Wizard of Oz. Sincere: So should a trader follow what the institutions are buying? Raschke: Yes and no. When something is hot, it’s hot, and when it’s not, it’s not. When the Dow and S&P are testing their highs, you don’t buy a stock that hasn’t moved. It won’t be a dog forever, but go where the money flow and action is. Once a trend is in place, it can stay in place for a while. Toni Turner is a trader with over 16 years experience and the bestselling author of a number of books including A Beginner’s Guide to Day Trading Online (Adams Media Corp, 2007) and Short-Term Trading in the New Stock Market (St. Martin’s Griffins, 2006). Sincere: How do you find stocks to trade? Turner: I maintain a comprehensive watch list of sectors and industry groups. I evaluate economic conditions and which sectors and groups are most likely to benefit from those conditions. Then I analyze daily and weekly charts of those groups. I choose strong stocks with the potential to move higher in bullish environments, and weak stocks that are likely to move lower in bearish environments. 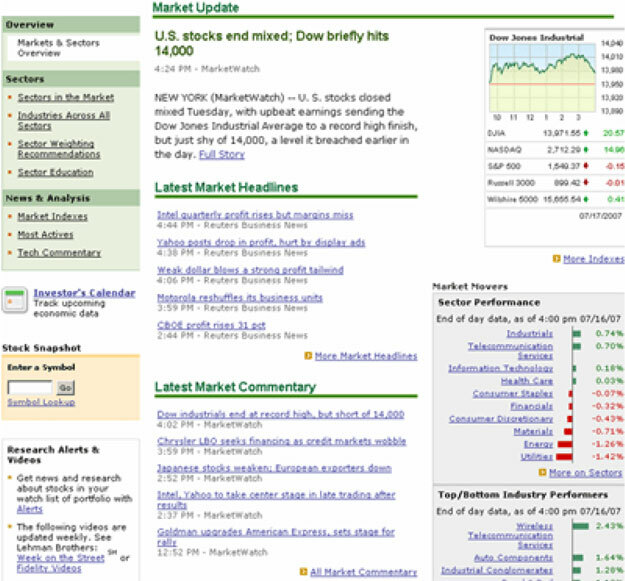 How Fidelity can help — Market & Sectors Overview. All screenshots and stock symbols are for illustrative purpose only. Sincere: So you focus on specific stocks and sectors? Turner: Exactly. It’s detrimental to scatter yourself over a whole bunch of stocks that you don’t have expertise on. I used to know a trader who used to trade only one stock: GE. He went long, short, and bought and sold options. He knew exactly how that stock was going to act in any given circumstance. Sincere: What technical indicators do you look at? Turner: On the long side I keep it simple. I like the 20-day MA, the 35-day MA, the 50-day MA, and the 200-day MA. I keep the RSI (Relative Strength Indicator) and OBV (On-Balance Volume) on my charts. I also like stochastics to tell me if there will be a bullish divergence (the price of the stock drops to a new low while the indicator climbs higher). And of course volume is key-especially volume spikes. Sincere: Where do you put your stops? Turner: I usually place my initial stops under the low of the entry day. When the stock breaks out and trades for an hour, or so, I may raise my stop to a point just below a consolidation area on an hourly chart. That helps to minimize risk. Sincere: Are the charts ever wrong? Turner: Like the song says: Don’t believe your lying eyes. It’s not the chart that is wrong, it’s my lying eyes. Once we get a pattern in our head, the hardest thing you can do is to admit that pattern isn’t playing out the way you thought it would or the way it played out before. Sincere: So how do you prepare for market uncertainty? Turner: In the markets it means being nimble and open-minded and recognizing that perhaps this is the end of an uptrend and the beginning of a downtrend. Something out of the ordinary is always going to happen, so expect the unexpected. I’m always surprised when Mother Market is in a nastier mood than I thought possible, so don’t jump in too quickly. Dr. Elder is a psychiatrist, professional trader, and the author of several bestselling books including Trading for a Living (Wiley, 1993) and Entries & Exits: Visits to Sixteen Trading Rooms (Wiley, 2006). Sincere: How did you get started as a trader? Elder: I knew there was a game happening in front of my face and some people were making real money and I knew that I would stick to it until I was one of them. I worked to build my capital, which was tiny in those days, and eventually I figured it out. Sincere: What kind of trader do you consider yourself? Elder: A very cautious one. Most of my trades are from a few days to a few weeks. Occasionally I will put in a day trade. I have a number of positions that I have held for more than a year which can be profitable, although it’s not easy. Sincere: What should traders do to be successful? Elder: Keep good records. As long as you keep good records, you can learn from your mistakes. I don’t allow myself to have breakfast until my diary is updated. Keeping and reviewing your diary is how you become your own teacher. Sincere: What have you learned about money management? Elder: The most important rule of money management is my 2% rule. You cannot risk more than 2% of your account. I risk even less than 2% because I trade a fairly large account. Sincere: What kinds of trades do you like the most and why? Elder: Everyone told me I should follow the trend. I finally said, ‘I’m not a trend trader, I’m a reversal trader.’ It’s a dangerous way to trade, but I love trading reversals. I have certain tools and techniques that identify when a certain trend is weak. When it’s weak, I start trading it. I have eight methods or rules for identifying when a trend is starting to weaken. Sincere: Where do you place your stops? Elder: I put fairly wide stops in the area where I don’t expect prices to go. There’s a lot of back and forth in the market so having a tight stop is asking for trouble. I look at the chart and I put the stop at the point where I am proven wrong. Sincere: At what point do you take profits? Elder: I have technical indicators that determine when the move is becoming internally weak. It’s also important not to get too greedy. No one knows where the top is. If the market is acting strange, take the profits. Even if you consider yourself a sophisticated trader, you probably recognize that reading an insightful book on trading can be a great way to sharpen your skills. But with bookstore shelves brimming with trading tomes, how do you separate the informative and valuable from the vacuous and dull? As a young adult in the 1920s, Edward C. Johnson 2d developed a growing interest in the equity markets while watching his father act as trustee for several family trusts. His fascination with the markets increased after readingReminiscences of a Stock Operator, which draws on inspiration from the life of legendary trader and speculator Jesse Livermore. Several years later, in 1943, Johnson became president and director of a small, Boston-based mutual fund, now called Fidelity Fund, which was the first investment fund managed by Fidelity Management & Research Company (1946) — today one of the world’s largest and most-respected global research and investment firms. Although written more than 80 years ago, Reminiscences is repeatedly mentioned by traders as one of the best educational tools for trading. It reads like a trader’s diary, but many traders believe the lessons included in the book are still relevant today. Dr. Elder, a trader and psychiatrist, was one of the first traders to recognize the importance of the emotional aspects of trading. He pointed out that a superb trading system with a poor psychological profile often leads to an unprofitable portfolio. On a personal note: Every time I discuss trading with Dr. Elder, I gain additional insight about what really goes on behind the scenes in the stock market. And that’s the essence of his book: It reflects his knowledge and understanding of what makes markets move up or down. Elder followed his first best-selling book with another, Come Into My Trading Room. These two complementary books are often mentioned as classics primarily because of the author’s probing question-and-answer techniques. In these books, Schwager delves into the minds of some of the country’s most successful traders to unlock the wisdom behind their profitable trading techniques. William O’Neil, publisher of the popular financial newspaper Investor’s Business Daily, was one of the first investors to clearly explain how to select profitable stocks using both fundamental and technical analysis. In his best-selling book How to Make Money in Stocks, originally published in 1988, he introduced traders and investors to his rule-based, common-sense trading approach — CAN SLIM™. The acronym CAN SLIM stands for: Current quarterly earnings per share, Annual earnings per share, New products, Shares outstanding, Leaders, Institutional sponsorship, and Market direction. “What’s so great about this book is that O’Neil takes the best strategies and combines them into one technique, CAN SLIM,” says Morpheus Trading Group’s Wagner. “He also gives specific rules that you can use when entering a position. Most important, he tries to keep you from buying stocks that will fall apart, and he does that by teaching you how to find quality stocks by combining fundamental and technical analysis.” Wagner adds that 80%-90% of the stocks that he buys are based on a modified version of O’Neil’s system. During a previous interview I had with O’Neil, he explained how he first used CAN SLIM to turn a small amount of money into a fortune. With his profits, he started his financial newspaper based on the successful theories included in his book. This best-selling book, originally published in 1949, is often referred to as the definitive work of fundamental analysis. College professor Benjamin Graham is considered by many to be the world’s greatest investment advisor of the 20th century because he introduced a generation of investors to a strategy called “value investing.” From an early age, Graham learned the importance of thoroughly researching a company and determining whether its stock price was a good value. Graham’s book can be useful to both investors and traders, according to several professionals in both camps. Consider what independent trader Howard Kornstein says: “Traders should read and study this book. Although The Intelligent Investor was written more than 50 years ago, it is not outdated. The fundamentals of the securities marketplace have not changed. If you’re going to take a long position, it benefits you to choose a company that is fundamentally stable. By reading this book, you learn to identify companies that are fundamentally sound and in position for a possible trade. Anyone who trades a company that is not fundamentally stable is likely to execute a trade that could result in a significant loss.” Kornstein said he chooses trades using a combination of charts and fundamental valuation. Although the original version of this book was found to be a difficult read for some novice traders or investors, the terminology of the latest version is markedly improved. Another highly respected Graham book — Security Analysis (originally published in 1934 with co-author David Dodd) — is considered a dietary staple for those considering a career in portfolio management. Portfolio manager Peter Lynch led Fidelity Magellan Fund to a 28-fold per share gain from May 1977 to May 1990, and is recognized as the most successful mutual fund manager of this generation. When he wrote One Up on Wall Street, in 1989, an increasingly larger percentage of the U.S. population was investing in the equity market, but many newcomers had little knowledge about how to buy and sell stocks. One of Lynch’s key messages was to understand the companies issuing their stock. With his friendly writing style, he explained in his book that investors could identify profitable companies based on their own experience and observations. For example, a person who worked in a shopping mall during his or her career might have an edge in the retail sector, just by watching which stores were busy and which products were big sellers. The person working at the mall could have seen a lot of good ideas just by observing consumers and talking with them. This kind of company observation helped generate several good stock ideas for Lynch in his term running Fidelity Magellan, and he would follow up on those ideas with rigorous fundamental research. “For new investors, Lynch teaches you how to use what you already know to make money in the market,” wrote author and former portfolio manager Joshua Kennon, who included Lynch’s book in his own top-10 list on About.com. Another important lesson Lynch sought to pass along to readers was that investing was serious business. He pointed out that many people spent more hours researching a new television set purchase than investing $20,000 in a stock based simply on a tip they heard from a neighbor. The Stock Trader’s Almanac is a reference book that many traders believe is a requirement for any serious trader. This almanac includes several graphs, historical charts, market data, forecasts, economic announcements, and a calendar of events, among other information. Although not 100 percent accurate in its recommendations, the book will give insight on historical market events and performance, and provide forecasts as to when the authors believe similar scenarios could occur in the future. In addition, the almanac will help identify specific trends that take place on a yearly or cyclical basis. For example, the book notes that the market tends to have higher trading volume during the first three weeks of a new calendar year. The authors also assess the probability of whether or not a similar trend could take place the following year. Many traders who use technical analysis mentioned the Edwards and Magee book as “the bible of technical analysis.” The book claims to be “the first to produce a methodology for interpreting and profiting from the predictable behavior of investors and markets.” What traders feel strongly about is that this book shows them how to use technical analysis to make money trading regardless of market conditions. It thoroughly explains all of the key technical trading concepts, including chart patterns, relative strength, candlesticks, oscillators, momentum and volume, moving averages, and other indicators. In addition, the authors explain how to spot trends through the use of these technical indicators. For a less-intensive understanding of technical analysis, Kornstein recommends Martin J. Pring’s book Technical Analysis Explained. Pring covers the technical indicators of the markets by explaining the concepts in simple, easy-to-understand language. Technical Analysis of the Financial Markets guides you from the first application of Dow Theory and the basics of charting through the latest computer technology and most advanced analysis systems. Written by StockCharts.com’s John Murphy, a former director of Merrill Lynch’s technical analysis futures division, this book includes 400 charts that clarify key points of the following: candlestick charting, point-and-figure charting, oscillators, Elliot Wave Theory, Fibonacci, and other technical indicators. This book is a collection of annual report letters by legendary investor Warren E. Buffett to shareholders of Berkshire Hathaway, Inc., the holding company for which he serves as chairman and CEO. Buffett is widely regarded as one of the most successful investors of the 20th century. Reading this collection of shareholder letters, carefully arranged and edited by Lawrence A. Cunningham, is like taking a course from Buffett himself, as you learn the thoughts and theories behind his investing practices. In his shareholder essays, you won’t find Buffett commenting much about the stocks he owns, but he loves to discuss the basic principles behind his investments. Many of his principles are derived from his study at Columbia University, where he learned — and later worked — under the tutelage of professor Benjamin Graham (The Intelligent Investor, Security Analysis). (6) an offering price (we don’t want to waste our time or that of the seller by talking, even preliminarily, about a transaction when price is unknown).